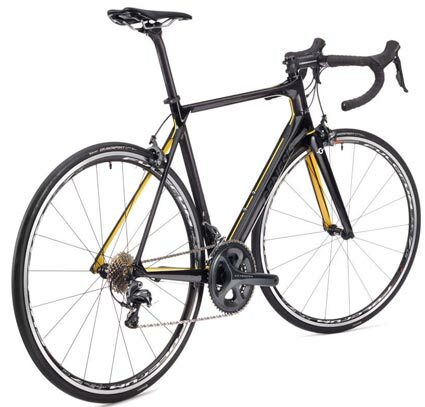 The Zero .3 is built for the keen road enthusiast who likes their bike to look just as good as it performs. We’ve taken the beautifully balanced, lightweight, comfortable, lifetime warranty equipped Zero frame platform and applied only the most minimal of gloss black paint-jobs. We’ve kept it clean looking on the spec too but in all honesty we’d be telling porkies if we called that minimal. A sizeable downtube and large, box section chainstays fully exploit the additional surface area and room provided by the wide, BB86 press-fit BB shell to deliver a stiff and efficient pedalling platform whilst the slim, flattened seatstays and toptube combine nicely with the Ø27.2mm seatpost to provide enough flex and compliance needed for long days in the saddle. The internal cable routing, aero bladed fork and dropped downtube help give an aerodynamic advantage along with a clean, flowing aesthetic. The Zero .3 comes dressed in a full new 11-speed Shimano 105 groupset, arguably the best bang-for-buck components they offer. Taking full advantage of the trickle-down technology from the higher tier Ultegra and Dura-Ace groups, the new 5800 components share many of the great features like powerful symmetrical dual-pivot brake calipers, a stiffer, lighter chainset with offset 4-arm configuration and hollow outer ring, more compact, ergonomical shifters and a revised front mech with longer link arm for precise and powerful front shifts. Already considered some of the best-in-class wheels at this level, the Fulcrum Racing 7 LG wheels sport a new-school wider rim profile for this year (23mm ext./17mm int. ), allowing the 25c Continental Ultra Sport II SL tyres to spread out more, increasing the tyre’s volume and reducing sidewall flex which in turn means lower pressures, increased comfort and improved stability for descending and cornering with a greater confidence. There’s something ‘right’ about properly done raw carbon road bikes and the Zero .3 proves this perfectly - form an orderly queue.